Pork Tonkatsu is a Japanese dish. It is traditionally served with shredded cabbage, pickled vegetables, rice and miso soup as a set. I recently visited Japan for the first time in ten years and fell in love with Tonkatsu again. I never fully appreciated cabbage until I experienced it in Japan. It is a side for many dishes there and demonstrates that something as simple as shredded cabbage with a sauce can be a delicious accompaniment. It can be a welcome alternative to green salad. The Tonkatsu set was also very popular with our children in our travels, mostly because of the deep fried crunchy meat, and the sticky rice. It is a good meal to practise using chopsticks for that reason. 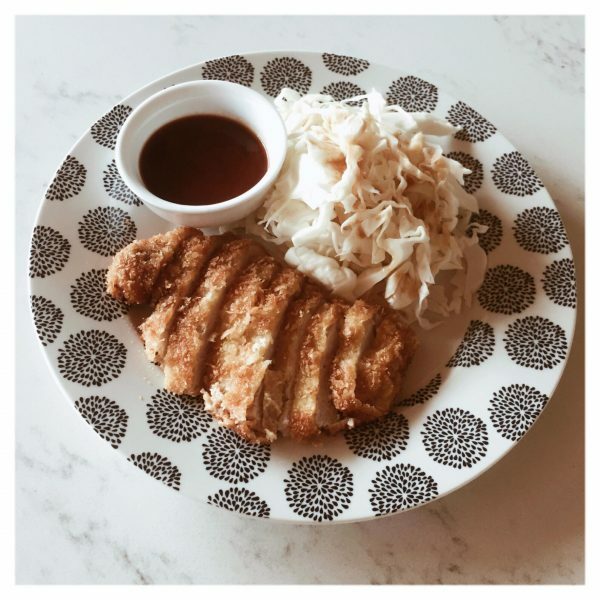 Whilst Tonkatsu usually uses pork fillets, it is also just as nice with chicken. Crack the eggs into a large bowl and add the milk. Then, whisk until well combined. Prepare two other bowls, one with panko bread crumbs and the other with flour. Next, take a pork fillet, cover in egg wash, flour, egg again and finally the breadcrumbs. Then repeat the process with the other pork fillets. When the oil is hot enough that a bread crumb floats quickly to the surface, put in the first fillet and cook for about five minutes or until golden brown. Flip the fillet to the other side for a further five minutes. Repeat the process with all the fillets and then put aside on paper towel. Finally, combine the miso paste, soy sauce, vinegar and oils in a bowl and mix well to make the dressing for the cabbage. Serve the sliced pork with tonkatsu sauce, a side of shredded cabbage drizzled with its sauce and a bowl of sticky white rice if desired. If you are unable to source (pardon the pun) tonkatsu sauce, you can create a similar one using one part Worcestershire sauce, two parts tomato sauce. This entry was posted in Blog, Recipes, The Organic Place and tagged Family Friendly, Japanese dish, Organic, organic cabbage, organic pork, Pork Tonkatsu, The Organic Place.